"A WONDERUL TRIUMPH OF THEATRE"
"CLEVER, VERY FUNNY AND BRILLIANTLY ACTED"
"A JOYOUS VERSION OF THE HITCHCOCK CLASSIC"
"NOW THAT'S WHAT I CALL A TRIUMPH"
"Alfred Hitchcock’s classic thriller, "The 39 Steps", has been playing at the Criterion Theatre in London, brilliantly and hilariously recreated for the stage as the smash hit Olivier Award Winning Comedy. And now fourthwall, a theatre company committed to providing access for the community to live performances of contemporary theatre, are bringing their production to Callington! This is an event not to be missed! An absolute delight for the entire family, this production is "impossible not to enjoy". 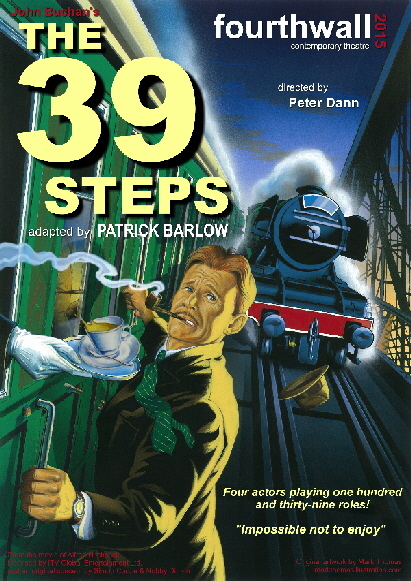 COME AND SEE "39 STEPS" IN CALLINGTON!